Greetings readers! I’m baaaack and I have a delicious treat just for you. Here in the United States this weekend is Memorial Day weekend. Memorial Day weekend is traditionally full of parades honoring the men and women that have served in the military, family gatherings, picnics, camping, and since it is the first long weekend since the snow has melted many see it as the kick start for summer. We have two family gatherings this weekend and I am really looking forward to both ( and I amÂ guaranteedÂ to have some delicious food). 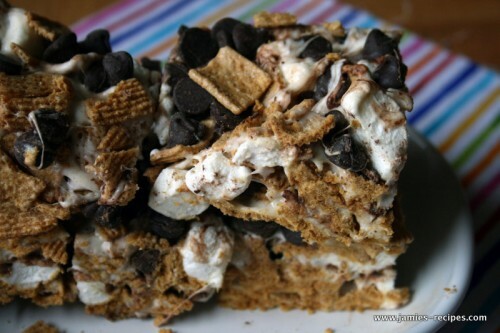 Since this weekend will be a big camping or picnic weekend for many people I thought I would share a tasty no-bake treat. S’mores are a must have camping treat for my daughters. I think eating s’mores are quite possibly their favorite thing about camping. Have you ever had a s’more before? S’mores are fire roasted (or toasted like how I prefer them) marshmallows, Hershey’s milk chocolate bars, and graham crackers sandwiched together. Easy peasy, messy, and delicious. You get your best s’more flavor by roasting them over the campfire, however, if your campground is under a burn ban (it happens when it gets really dry in the summer) or you’re camping at a camp ground like my parents that doesn’t allow any campfires, these bars would be a great alternative. 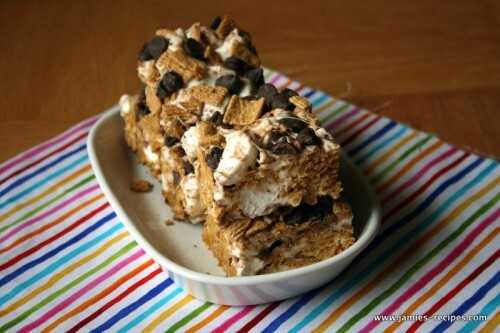 Plus these bars are great for young ones since s’mores can get really really messy. Enjoy the grahamy, marshmallowy, chocolatey treats! 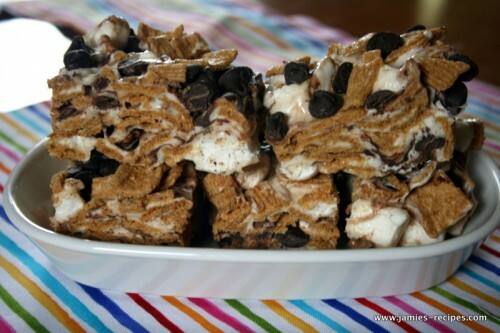 In a large bowl add Golden Grahams, mini marshmallows, and chocolate chips. Set aside. Grease a 9x13 pan. Set aside. In a sauce pan over medium heat brown the one stick of butter. Make sure to keep a careful eye on it. You want the butter to be golden brown. It can quickly go from browned butter to burned butter. Turn burner off. Remove pan from stove. Stir in 10 oz of marshmallows until all are melted and smooth. If marshmallows aren't melting completely place pan back on burner turned to low and stir constantly. Pour browned butter - marshmallow mixture of the bowl of Golden Grahams. Stir constantly to completely cover all the cereal. Press Golden Grahams into greased pan. Set aside to cool. Once cool cut into bars. YUM!!! Jamie – I have a request for your next recipe. I am trying to lose weight (a good 50 lbs couldn’t hurt this physique!) — If you have any and want to share a health-concsiouc recipe, that would be great! This is a great recipe. How do you prevent the chocolate chips from melting? Mine were frrozen before hand but still melted instantly. I just made these, they are in the fridge now cooling off!!.. easy easy easy to make! however I have the same question as stefanie… the chip melted instantly.. mine was also frozen.. still looks yummy.. but also messy.. lol.. I guess we will see!